Accepting a locum tenens position promises time to experience a different hospital or medical practice and a chance to explore a new location. This opportunity comes with a lot of excitement, but if you must go alone, the distance can impact your relationship with your significant other. It’s natural to miss your partner; however, if you prepare, you can use the time apart to strengthen your relationship. Remotely sharing your separate experiences with one another can add value to the time you share and allows you to relive the early discovery phase of dating. Communication is key. Make sure that expectations for the type of contact and its frequency are clear. Have a conversation with your partner and agree upon a convenient time and method to stay in touch, whether through sporadic text messages or a single phone call at the beginning or end of your day. If you’re in different time zones, be sure to factor that into your discussion and consider times that work for both of your schedules. Being on the same page before you leave for your placement can help alleviate feelings of uncertainty while you’re away. Also, don’t be afraid to get a little creative! 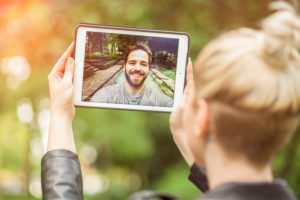 Even though you’re both busy, taking a few seconds to send pictures, audio clips, or quick videos allows the other person to catch a glimpse of your surroundings and feel more connected. These snippets help the two of you experience moments together despite not being in the same location. In an era where technology dominates communication, handwritten letters are a nice surprise. For longer placements, “open when” letters are a great way to provide a special message to your partner when he or she might especially need the reminder. These letters could either have a specific date to open, or you could reserve them for a time when your partner misses you or feels stressed. Honesty and small gestures like these can help smooth your relationship’s transition as you start your placement. Little treasures can go a long way in making someone feel special. Providing your significant other with a memento to hold during the time you aren’t there could help ease the distance. This item could be a token from one of your first dates (something your partner didn’t know you kept), a cherished heirloom from your family, or a piece of jewelry. The more sentimental value, the more meaningful this keepsake becomes. Similarly, sending a gift (you don’t need a reason or a lot of money) could generate a smile and arrive at just the right time. The gift could be something specific that you know he or she will like, or it could be something a little more obscure and specific to your surrounding area. Either way, this gesture shows your significant other that you are reminded of him or her even when you’re apart. Recreate the little moments. One of the hardest parts of being away on a locum tenens assignment is the lack of shared experiences with your partner. It’s disappointing not to be able to go out together and try a restaurant, visit a landmark, or see a new movie. Fortunately, if you employ some workarounds, you can still participate together! Set up a video chat to either cook a new recipe and “have dinner together,” or head out for a walk so that you can each experience the other person’s surroundings. You also could agree to watch a TV show or movie at the same time and either text during important parts for real-time reactions or watch at your own pace and chat about it the next time you talk. If reading or listening is more your style, decide on a podcast or book and check in with one another as you progress. These experiences help you continue to connect over a shared activity and inspire new conversations, leading you to rediscover an appreciation for your partner’s thoughts and ideas. And when you’re there, be there. Depending on the length of your locum tenens assignment, it might be hard (or even impossible) to coordinate a trip to see your significant other. However, if you get the opportunity to show up at a notable event, like a holiday, birthday party, or graduation, you should. Similarly, if you can meet halfway or arrange for your partner to visit, that helps hit refresh on your time apart. Sometimes, even a brief face-to-face visit can help carry you both to the end. Whether your quality time happens while you’re still at your placement or when you finally arrive back home, make sure that you honor it and eliminate other distractions. Remember how much you missed one another when you were apart and appreciate the little moments you do share. Then, if you decide to start looking for a new locum tenens opportunity, you’ll have cherished your quality time and the next placement won’t be as difficult. Begin exploring new opportunities with Medicus Healthcare Solutions by calling 855.301.0563 to speak with one of our experienced recruiters.